I wasn't going to say bye to Australia without visiting the Opera House. While the countdown ensues for when I return home next month, I am desperately trying to fit in all the things I said I was going to do in Australia before I leave. Luckily for me, my university program sponsored a trip for us to spend a weekend in Sydney. So, the city is now crossed off my Australia bucket list. I've been to Sydney twice before but almost 10 years ago. Back then I spent New Years Eve in Sydney sitting in the living room of my grandparents' house with my family. Since then, I've been wanting to return so badly just to feed my nostalgia. It was as beautiful as I remembered. We arrived Friday night and the first thing we did after settling into our hostel was hit the clubs! It was the birthday of someone in the program so we all gathered to celebrate. I must admit it wasn't that great of a night... we were all exhausted from the plane ride and the club um, did not have as young of a crowd as we thought. We slept a couple hours till it was time to get up and explore the city. I was in the bubbliest mood because the sun was shining bright and there were no clouds in sight. We stopped to get fruit popsicles that reaaallly hit the spot. I was so excited to eat it I forgot to snap a photo until I was halfway done! And to no surprise, I got the Kiwi and Apple. I love my Kiwis like no other and frozen Kiwis are even better. 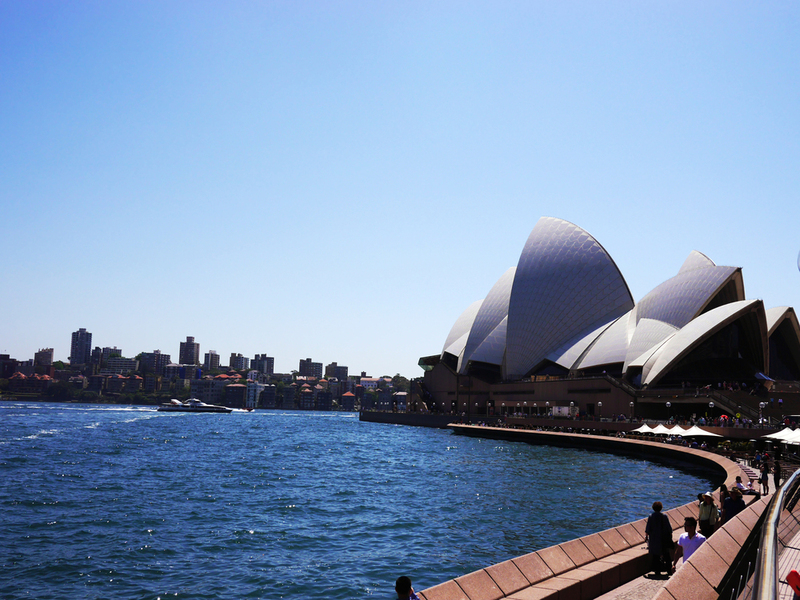 We toured the Opera House, which I would recommend anyone visiting Sydney to do! Not many are able to see the inside of the beautiful structure. Learning more about the journey it took to build it definitely increased my appreciation for the building. Plus, if you are in luck like I was, you'll be able to see performers preparing for their shows in the theatres. The acoustics in all three theatres are a dream for your ears. It was already noon after the tour so we grabbed some food and a cold drink. This sneaky bird snatched the last bite of hamburger on the table. Who knew it could fit such large amounts of food in that little beak! All it's friends followed, stealing food from other tables. Jeez, birds in Sydney are smart as hell. I laid on the sand and napped for a solid hour. I'm not even sorry I didn't get to snap a photo of the beach. ALSO, for all future visitors: the beach next to the pier is NOT Manly Beach. That is a mistake my friends and I have still not forgiven ourselves for. What is the "real" beach is a 5 minute walk following the signs "Surf Beach." But we rock at eating next to a beautiful view. Shenanigans from my last day in Sydney coming up next!